We all need to de-clutter, but there are many great reasons to keep old greeting cards that you would normally throw out. Think of them as specialty paper that can be used for a variety of purposes. These upcycled greeting card projects turn old greeting cards into the gift that keeps on giving. We actually have more than 25 reasons to keep old greeting cards, so just keep scrolling down to see them all. This is our first favorite way to recycle gift cards. With dozens of templates to choose from, you can adorn any of our free printable templates with sections of greeting cards. This is a much quicker way to finish a project! Cut out sections from the front of greeting cards to use as cover designs for our boxes, gift card holders and other templates. Use a cut-out to become the top of a reveal card. This is our second favorite way to recycle gift cards. We cut the covers into 2"x3" sections and use a paper hole punch at one end to add a tassel or pretty ribbon. Then just write your To and From message on the back. By simply adding an blank insert inside an old greeting care, you can cover the print and any personal messages and/or signatures. Then just add your own message and sign. If you'll be re-gifting greeting cards, remember to use a pencil to lightly add the name of the person that originally gave you the card. That way you can avoid accidently giving it back to the same person that gave it to you. 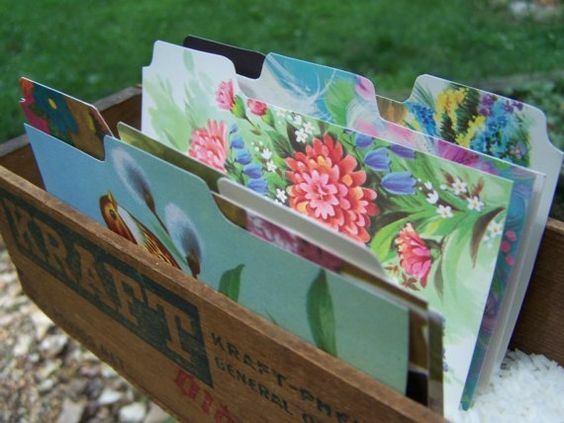 If you're a gardener and share or gift saved seeds, make a pretty seed packet from the cover of a greeting card. Cut out two equally sized pieces from the greeting card (depending on what size you want the packet to be. Using a glue stick, apply glue to the 3 of the outer edges of 3 sides (bottom and both sides) of one piece and glue the two sections together. Allow the packets to completely dry overnight. Then add your seeds and glue the top closed. Add a label to the front to identify the seeds. Rather than just add a blank insert to reuse a greeting card, give it new life by creating a completely new card. Cut out the front of the greeting card. Use craft edged scissors to add a pretty scalloped edge. Or leave the edges straight and add a ribbon on them. Then affix the cover onto card stock to create a new card. Pillow boxes are cute little containers for gifting small items such as candies, cookies, gift cards, money, etc. They are super easy to make. Use the cover of one greeting card for a small pillow box, or two greeting card covers for a large pillow box. Sometimes the images on a greeting card make perfect pop-up adornments that you can use to create new cards. Just trace the outline using an X-ACTO knife. Add small 1/4" tabs to the top and bottom of the pop-out by cutting out a 1/2" piece of paper and folding it in half. Using a glue stick, affix the tabs to the cut-out and fold the tabs flattly against the cut-out. Position the cut-out inside a card or folded card stock, and test how the pop-up is aligned. Once you're happy with its positioning, add glue to the back of the cut-out's tabs, fold the card closed and press. Embellish your mason jars if you're gifting them. Use the lid to trace out a section of the card then add the card circle to make a pretty little topper. Some greeting cards have a focal square or round design in the center. Make a pretty medallion embellishment by cutting this out and affixing it with double- sided tape, double-sided foam, or hot glue to a slightly larger piece of card stock, You can use the medallion to make a new greeting card cover, or use it to adorn a wrapped gift. Use a paper hole punch to add a hole; add string or ribbon and you have a nice adornment to hang on a bottle of wine. If you are going to gift your favorite recipe, why not give it the flair it deserves. Our website's template section has loads of paper gift box templates that you can use to turn greeting card into the cutest gift boxes. Instead of an ordinary bow, add a 3D embellishment to a gift. You can make a heart or star by cutting 3 graduated sizes (for example: one star at 1", then next at 1.75", and the next at 2.5"). Attach them together using either double-sided foam tape or hot glue. If you're making a 3D butterfly, you'll have a nicer effect if you keep all 3 cut-outs the same size or only minimally graduated in size. Need a way to upcycle all those Altoid tins you didn't throw out? Affix a cut out of a greeting card to the top using a glue stick or double sided tape. You can also line the inside with a piece of the greeting card. Cut out pretty images from the cover to greeting cards and decoupage them to cardboard or wood. Think of the pretty coasters, or little gift boxes you can make. Next time you are gifting a flower bouquet or a potted plant, cut out a pretty portion from the front of a greeting card and write a short message on the back. Add the card using a floral pick, or tape to a long wooden skewer, or make a floral pick using wire and adding a swirl head to hold the card. If you are a scrapbooker, you already know how precious embellisments are. No need to buy or print cut-outs when greeting cards are a gold mine of pretty little parts that you can use. The patterns make for beautiful borders and there are usually many other images you can trace out to use. A standard bookmark is 2.5" x 8.5" in size. Just measure out a pretty section of the card to match those dimensions. Use a paper hole punch at one end and add a tassel or pretty ribbon. By adding a piece of card stock to the back, you can turn the front half of a pretty greeting card into an instant postcard. If you are planning on giving someone a collection of personalized gift certificates ("good for one hug", "one day of chores", etc), you can bind them all together by adding the cover of a greeting card (cut to fit). When it's time to send out your child's newest school photo to family and friends, create a little frame using a gift card that has been cut 1" bigger than the dimensions of the photo. Add a center cut-out that shows the photo. Then add cardstock to the back and tape or glue the perimeter edges closed. Not only is it a cute way to present the photo, but it also protects it until the recipient can place it in a real frame. This is one of the easiest ways to prettify a CD sleeve or box, especially if you are gifting a homemade video or image collection. Just cut out a section of gift card to cover the CD sleeve and affix using double-sided tape or a glue stick. If you have a CD box, you can use the existing sleeve to trace onto your greeting card then insert the new card sleeve. If you need to assign seats at your next gathering, cut out 4"x3" sections from the cover of old greeting cards. Fold in half, then add the name of each guest to the front. Use birthday cards for a birthday gathering, or other cards to match the theme. Granted, not that many greeting cards warrant becoming art in your home. But if one has beautiful imagery that matches you home's colors or themes, why not turn it into a work of art by framing it. Stocking initials are an elegant way to identify the "owner". Holiday greeting cards make beautiful stocking initials. You can just cut out an initial directly from a greeting card, or glue the card directly onto a purchased initial and then cut out the card by tracing. Or use our Online Stencil Generator to create a printable stencil that you can use to trace onto your greeting card. Use the cover of a greeting card to create a giant gift tag. Add a hole using a hole punch and attach to the gift bag using ribbon or twine.